Democrats / liberals have good reason to want to jump all over Howard Schultz. 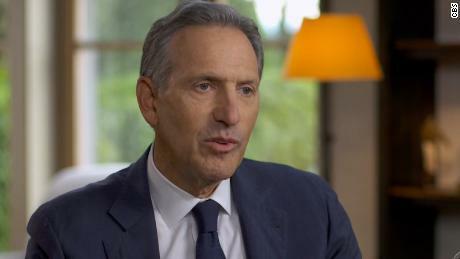 The Starbucks owner and potential independent presidential nominee in 2020 could totally turn over the apple cart as Democrats work hard to oust Donald Trump from the White House, or whomever else that Republicans might run in his place. Ralph Nader ran as a third-party candidate in 2000. Had he not, in all likelihood, Al Gore would have defeated George W. Bush. Imagine if on September 11, 2001 the United States had a president who wanted to avoid war and who could bring reason to the American response to the terrorists who hijacked those planes and killed nearly 3,000 people. Further, imagine that when Al Gore was elected, he would have paid proper attention to the intelligence warnings, as Bush did not, and the whole debacle could have been avoided. We often hear terms like “facts matter” and “words matter.” There is no arguing this wisdom, but we can also add “judgment matters.” When we think of 9-11 and its aftermath, there are two key decisions that allowed dysfunction to occur. First, Bush was “elected” (not by the popular vote) and Gore was not. Second, Ralph Nader set the table for all of this to happen. As brilliant as Nader may have been, his hubris exceeded it. He talked about there not being a dime’s worth of difference between Bush and Gore, and even after 9-11 when it was crystal-clear, he did not acknowledge the deficiencies of his actions. So, if Howard Schultz wants to run as an independent in 2020, I will beg to differ with other progressives and say that it’s okay, but with a major caveat. That condition is that if he should reach a level of viability that he would pose an electoral threat to the Democratic nominee, he will have to withdraw. And, in fact, he has indicated that he would do that as has possible campaign manager, Steve Schmidt, someone of enormous political acumen (particularly when he is operating as a journalist). Abolish the Electoral College and replace it with a direct popular vote. According to PRRI, by roughly a two-to-one margin, Americans say they would prefer if presidential elections were decided by the national popular vote as opposed to the Electoral College. Nearly two-thirds (65%) of Americans believe that presidential elections should be decided based on the national popular vote, while about one-third (32%) believe they should be decided through the Electoral College. The entrenched politicians in each party don’t like abolishing the Electoral College because they have become experts in gaming the undemocratic system that we call the Electoral College. The way that the system works now, if no candidate receives a majority of the electoral votes (270 or more), the election is thrown into the House or Representatives. This happened in 1824 and 1876 and the results were not pretty. So, the question would be, what do we do with a direct popular vote in which no candidate receives a majority. Adopt a very viable alternate system called 1-2-3 voting. This is where each voter gives his or her first, second and third choice for president / vice-president. If a voter’s first preference does not win, then the second choice of the voter is added to that candidate’s tally. The same would be true for third choice, and so on. This system is frequently called ranked choice voting (or instant run-off voting), but those terms are harder to remember than 1-2-3 voting. Now we can see how Howard Schultz could play a remarkable role in American politics. His popularity could be potentially high enough so that he could put a scare in a lot of Democrats and Republicans (particularly Democrats). But unlike Ralph Nader and others, Schultz could use his standing to point out how the problems that he created require solutions others than despising the messenger. What is needed is for the Electoral College to be abolished and for a 1-2-3 system of voting to replace it. Schultz is 65-years old, so this would probably be his final chance to become president. But he would have to be truly out of touch with reality to think that he could win in 2020 as an independent. He has already had a remarkably successful life. He won’t become president, but he could be the person who brings the kind of reform to American politics that have been needed for centuries. That would be a crowning achievement.